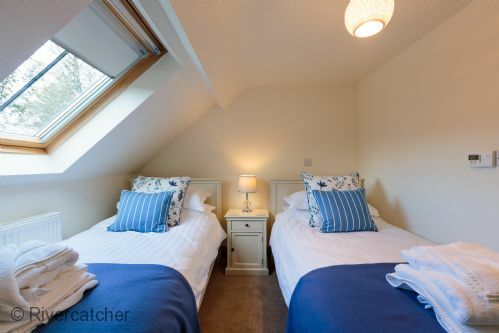 This luxury cottage has three bedrooms one of which has an en suite with the other two sharing a spacious bathroom with separate shower and roll top bath. The living space leads on to the raised outside decked area so that the meandering river views can be seen from both inside and out. We were pleasantly surprised at how beautiful the location was and the cottage was almost perfect. 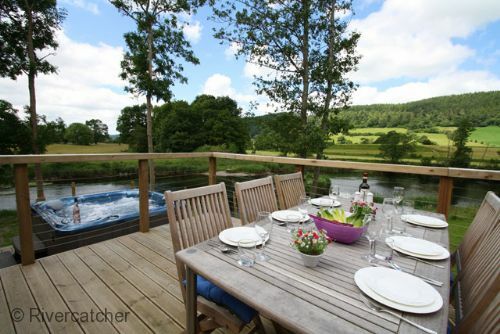 Watching the river flow by with assorted wildlife was a relaxing way to wile away a few hours, whilst sitting on the terrace or in the hot tub. Paradise! 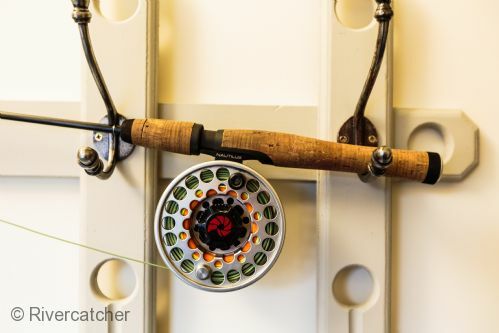 We couldn't have asked for anything more from our stay at Flyfisher's Cottage! Every room in the cottage is beautiful and clean, and there are lots of little touches to make the stay extra special. Would highly recommend and we will definitely be coming back! What a way to see the New Year in. Love this place. Keep coming back for more and can never get enough!!! Cannot wait until we book again. The cottage was exactly as we expected, very comfortable, in a brilliant location. We were very happy with the property and had a great week. 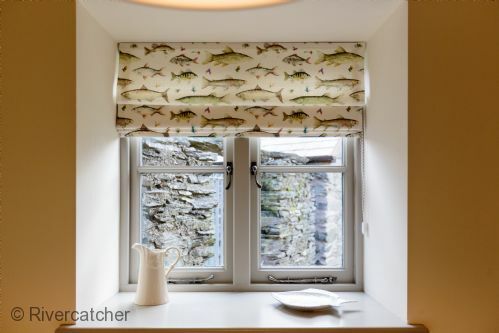 Flyfishers cottage is a very comfortable cottage which provides spacious accomodation for 6 people . It is immaculately clean and well equipped. The hot tub overlooking the river is perfect for relaxation . I have stayed here twice and will be back again its the lost beautiful place a real home from home. The owners make it just that little bit more special with the little touches. Wonderful location - the first place I have stayed and there is no traffic noise - bliss ! Very comfortable and lovely furnishings. Enchanting views of the hills and river. So great to have an enclosed garden for dogs. It really makes the holiday so much more relaxing ! Perfect venue, perfect weather, perfect week! 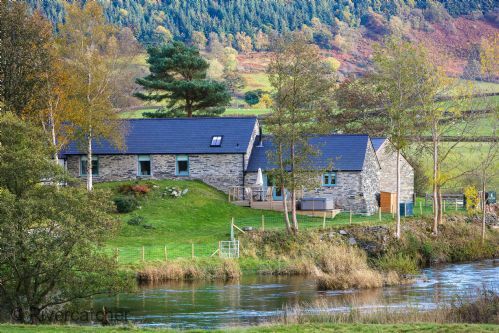 A beautifully located holiday cottage on the banks of the river Dee with the benefit of good food ( in various forms ) just a short walk away. Staying in a cottage with two grandsons of five and six is very easy in fine weather but it is a different story when it rains for six of the seven days. The excellent cottage helped a great deal in making this a very enjoyable week from the daily watching of the tree creeper just outside the window to guessing what would be swept downstream by the flooded River Dee. My wife and I loved the peace and quietness (when the grandsons were out) and we appreciated being left alone by the owners. When we did need help in sorting out the heating it arrived quickly and was solved very quickly. We considered the whole holiday as a success and very good value for money. We are very likely to return but hopefully in the dry season. We take an annual trip with our 4 children and their partners. This year it also involved 4 dogs so finding such a welcoming place as Rivercatcher was a real bonus. The cottages themselves are superb and I particularly like the privacy that each cottage has considering it is quite a compact complex. They are finished to a very high standard, in a beautiful setting and great value for money. The welcome packs for the dogs was a lovely touch. We really enjoyed our visit and the cottage was everything we wanted and more. Lovely Location, lovely attention to detail and all our needs catered for! Very generous Welsh breakfast produce provided which was of the finest quality. Thank you! Highly recommend a visit and we will be back. Stayed in the flyfishers cottage for 3 nights with my family and friends! From the moment we set foot in the cottage our stay was amazing! The cottage is very well presented and clean and the welcome hamper is very generous! The surrounding area is beautiful and the views out of the windows are stunning! We will definitely be returning for another stay in one of the cottages hopefully in the summer for a week to make the most of the garden and river! The website for the location and cottages at Rivercatcher do not do them justice. The setting and quality of the accommodation is idyllic. We always look for accommodation that is alike or better than our own home and with Rivercatcher we got it. There was nothing that hadn’t been thought of with the accommodation. 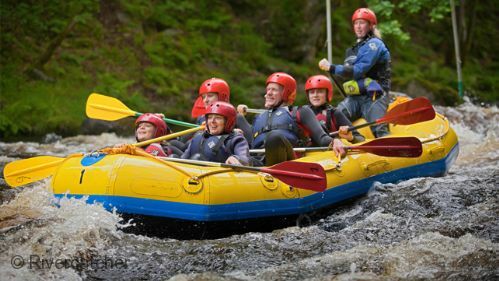 We certainly will be booking at Rivercatcher again. The range of accommodation of the five cottages will cover most party sizes and there will be an extra addition of four wood lodges next year. Can’t fault this place. The ambience, the cottage and surrounding natural beauty is a very pleasant breath of fresh air... Literally. The cottage has all that you need and the facilities are so good, you really do not have to think about anything. The riverbank is meditative, as is the beautiful environment it is all set in. 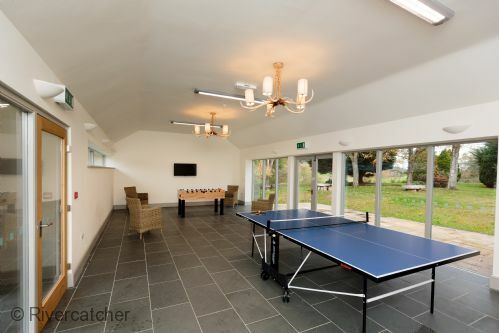 The lodge was used wholeheartedly, especially the table tennis! We hired two cottages; both the Gamekeepers and Flyfishers, they were both enjoyable and relaxing to stay in for our family and friends. We will be returning to this lovely place. Thank you to everyone at Rivercatcher who made our stay so enjoyable. Fantastic accommodation in a tranquil setting. 10 / 10. 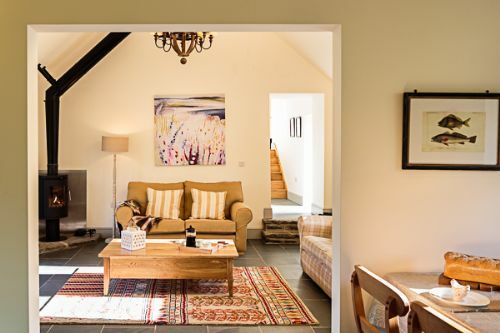 A place to go and unwind and relax in a beautiful setting - could not want for any more in the cottage. 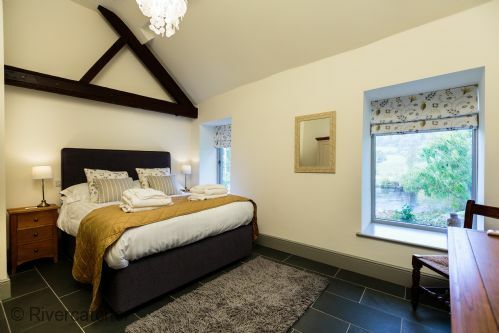 An ideal base to explore the stunning Snowdonia National Park. The cottage was immaculate, very clean and everything provided. Aled was particularly helpful and brought us supplies such as cling film, tin foil and even a new frying pan as the one in the cottage was a "bit knackered". 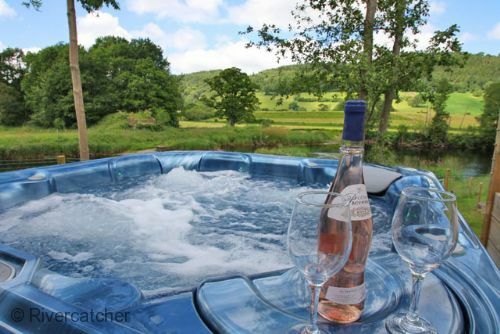 The only one slight criticism is that it would have been nice to be able to see the river bend from the hot tub, as the upright cover blocked the stunning view which is a opportunity lost! The cottages setting is breath taking, being in the valley surrounded by stunning landscapes and so much nature. The cottages are so well laid out and maintained and has all that you need, having a dog we were so impressed how dog friendly it was, with the little touches of a bowl and blanket at the cottages. Also we never worried about our boy getting out very secure. A fab place for all!! Perfect location. The house had everything we needed. We felt totally at home. The hot tub was lovely. The house was great for both children and dogs to. We all really enjoyed our stay and want to go back. The area was so beautiful and so much to see and do. The accommodation is set in the most beautiful of locations. Come winter or summer I am sure you will not be disappointed. The property was spotless and far exceeded expectations. The quality of decor, fixtures and fittings is very high, with great little touches from the owners. The owners are also very helpful, we stayed with two dogs and a young child all of which they accommodated. 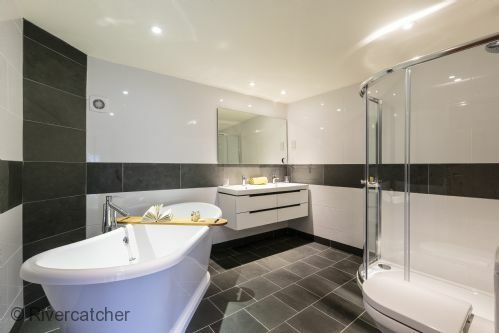 Plenty of useful and helpful information about the property and area provided too. We will definitely stay again! You get what you pay for - and more! This has been our second visit to Rivercatcher - with the fun of Storm Doris thrown in this time round. The location on the river is stunning, the cottage is fabulous. Not the cheapest break but you get 5* accommodation and absolute peace and quiet. Aled is a star, catering for anything that's gone awry, We just love it and hope to be back soon. Booked this cottage based on the website pictures and narrative and we were not diappointed. 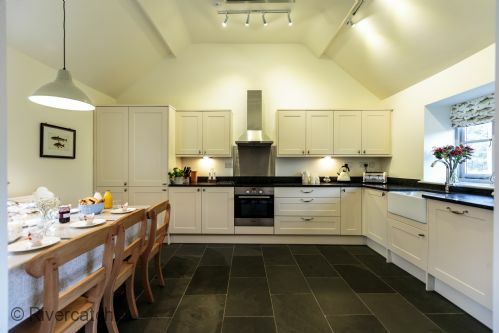 This cottage is lovely, it's cosy and the furnishing are great. We stayed in January with snow on the ground, with a wood burner, plentiful supply if wood, underfloor heating, hot tub that's really hot....it was magical. Aled the person who visits everyday to make sure everything is working was friendly and informative. This really is a find and I'm positive we will be back! 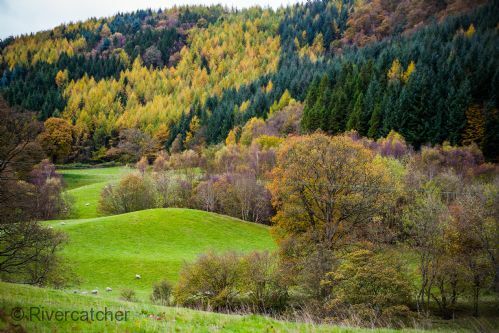 The location is great as you can get into snowdonia and the coast but not that far off A5. We stayed in Flyfisher's Cottage for a week in August 2016. My husband, my son, our two dogs and I. In theory it was a four hour journey from our home in Surrey, but the M25 had other ideas and it took us seven hours to get there. Despite that, every single stress just melted away the moment we walked in the door. The house, the space, the furnishings, the décor, the view, the peace...all absolutely faultless. The weather wasn't amazing but it didn't matter a bit. There were plenty of places to visit and, one day, Rivercatcher arranged for a dog sitter to come and look after the dogs for us whilst we went out for the day. Everything had been thought about. We had everything we needed and more. The view from the bedroom windows was just breathtaking, even in the rain! We loved Rivercatcher so much that we've booked again for next year and we really can't wait to get back! Highly, highly recommended by all of us, including the dogs who thought the safe and fenced-in garden was a joy! Our second visit - we will be back !